Note: Our audio review of the Podcast was on Show # 8, if you want to hear us discuss Star Wars: Frames. Star Wars: Frames is a visual masterpiece of images collected by George Lucas, who personally took two years to go through over 1 million frames of his six Star Wars films. The end result is 1,416 images from the films, and it is a gorgeous tapestry of the Star Wars saga, presented in a way that you have most likely never experienced. Think of the films as something you might see in an art gallery, and you have Star Wars: Frames. Fans have clearly seen images of the films countless times. However, the way the book displays these universal images is truly is a work of art. The photography and design are unparalleled in beauty and emotional impact; you will find yourself humming John Williams’ soundtrack to yourself as you turn each page, as well as quoting the dialogue with each turn of the page. The open book displays four striking images (two on each individual page) that go through each film in chronological order, and the results are immediate and breathtaking. It is hard to emphasize how well put together and visually stunning Star Wars: Frames is. 2) I need to watch these movies immediately! Perhaps my fourteen year old said it best, “That is probably the coolest book I have ever seen.” He is not wrong, as the book showcases images indelibly left in your mind’s eye, while also showcasing scenes I would not have previously guessed would be there. For instance, Luke’s famous scene in A New Hope, where he views the twin suns of Tatooine, while reflecting on his life ambition is not placed here, but the moments leading up to it are. We know the films so well, but these particular photographs will charm you, as well as take you by surprise, when you see what George Lucas has chosen to showcase. It’s almost like Lucas (who has already poured over these films more than we can imagine) tried to find new ways to inspire with these iconic images and characters. There are also some great close ups of the actors we know and love that really reflect the talent and charisma put into their respective characters. Ford’s scenes from Empire and Jedi stand out, as do some reflective moments from Carrie Fisher. It really is stunning to watch these iconic scenes frozen in time for you to enjoy. 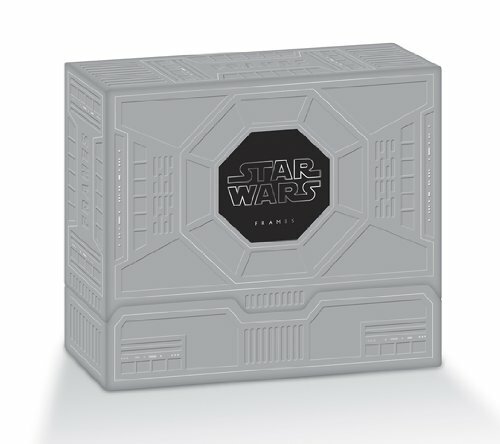 The set is broken up into two individual books: The Original Trilogy and the Prequel trilogy, and together, the entire collection weighs 19 pounds. It is impressive … most impressive (sorry, couldn’t resist), and if you don’t mind the $150.00 price tag, you are in for a real feast for your eyes that will open up your imagination to those magical moments only Star Wars can replicate. This really is the best thing to watching the movies again, and will most likely have you running towards your Blu-Ray player to relive these wonderful scenes. I took an inordinate amount of time perusing each page, engrossed in the emotional pageantry presented here in six films I have seen numerous times. You will find yourself wishing the book offered an opportunity to order portrait-sized images of each frame, because they are that striking. It is worth mentioning that the book is available for 50% off at Amazon.com, so check it out now for this amazing price! Note: A big thank you to Abrams Books for providing an advanced copy to review.. I just ordered it for that fabulous 50% off price at Amazon. Being called off work due to wind chills and one-click ordering is a deadly combination! But seriously, what truly attracted me to this is the idea that George Lucas pored over these images one-by-one. I watched the video and you can just see how important this project was to him. Yes, it’s a collection of photos, but even more than that it’s a reflection of the passion of one’s life’s work. I’m SO excited to get this now. I’ll just need to have some more days off to enjoy it fully!